The Carter Center is hosting a June 15 discussion on anxiety disorders with Rosalynn Carter Mental Health Journalism Fellow Andrea Petersen and Carter Center Mental Health Program staffer Rebecca Palpant Shimkets. Petersen, a Wall Street Journal health and science contributing writer, will discuss her experience with anxiety. She writes about her personal story, the biology of anxiety, and the most current research on its causes and treatments in her book “On Edge: A Journey Through Anxiety” by Crown Publishing Group. 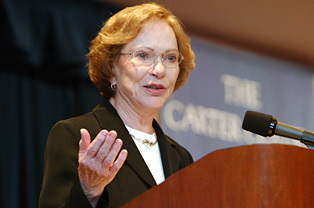 The event will include opening remarks from Rosalynn Carter, co-founder of The Carter Center, and is scheduled to begin at 7 p.m. in the Rotunda of The Carter Center. The public is invited to attend and must RSVP here by June 8. Please note that seating is limited. Media wishing to attend must RSVP to rennie.sloan@cartercenter.org by June 13 at 5 p.m. The event will be broadcast live on the Carter Center Twitter account @CarterCenter. Viewers may join the discussion using #OnEdgeBook. More about the book is here. The program schedule is below. The event will take place in the Carter Center Executive Offices Rotunda/Upper Commons at 453 Freedom Parkway, Atlanta, GA 30307.